It’s finally starting to feel like spring over here in Connecticut, and with the beauty of spring flowers comes the ugly of allergies and sinus infections. Many of us suffer from seasonal allergies and sometimes even the change in weather (although a positive change) can make you feel a little off. Being sick can be incredibly inconvenient especially when you’re working towards being in your best shape for summer. 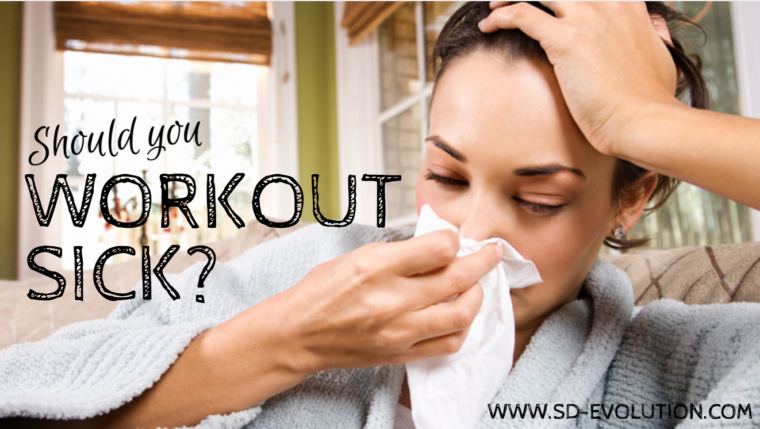 A common concern we get from our clients this time of year is on the topic of training while you’re sick. Should you do it and push through? Should you rest? There’s so much conflicting information out there, so let’s clear some things up. You’re probably thinking, “Isn’t health the same as fitness?!”. The answer is no. Fitness can sometimes be extreme and usually involves just your physical body whereas health is the overall big picture that includes not only your body but your mental state, emotions, and recovery. If you’re sick with a cold, virus, infection or something that’s a little more than light allergies, you’re probably better off taking a few days off from intense training and focusing on recovery. Your body simply won’t be able to fully recover from whatever it’s fighting if you continue to exhaust it and place more stress on it through resistance training or cardio. Try to keep your health at the forefront but also listen to your body. Our bodies are so incredibly smart and usually, try to tell us when to back off our jam-packed schedules and busy lifestyles. Most people don’t get enough sleep. On average, it’s suggested you should aim for 7-10 hours per night. For most people hitting that 8-hour sleep mark is perfect but rarely do they get that. If you’re putting all of this effort into your training and nutrition, yet your sleep is garbage, chances are you’re not progressing as fast as you could be. Make a deal with yourself to get to bed even 20 minutes earlier than usual, adopt a consistent bedtime routine at night, or give yourself that extra hour in the morning instead of rushing to get a workout in. Trade strength work + high-intensity training for yoga and meditation. Remember that thing I said above about prioritizing health over fitness? If you’re feeling lousy, chances are you’re probably a little stressed out also. Instead of hitting the gym for a high-intensity training session or interval work (which believe it or not is an added stressor on your body), stay home and do some calming yoga or follow along with a RomWod session to still get some movement in, but let your body chill out. Yoga and meditation can be great for your body AND mind. One of the biggest misconceptions when it comes to dieting is that if you aren’t in the gym that day, you don’t *need* as much food. Listen up friends, if you’re sick, stressed, recovering or just feeling plain yucky…YOU NEED CALORIES. Keep fueling yourself with nutrient dense food sources to optimize recovery so that you can get better faster, and therefore get back in the gym feeling 100%. Now obviously if you have the stomach bug, that’s a different story, but if you’re fighting a cold or some kind of sickness and you still have an appetite, you need to eat. Slashing calories will only delay you feeling better. So next time you’re wondering if you should just push through that workout, or stay home and cuddle your dog weigh your options, listen to your body and make the best choice that supports your health. A few days, heck even a week off from the gym will not kill your progress. Think about how small that one week looks if you zoom out and refocus on the rest of your life.